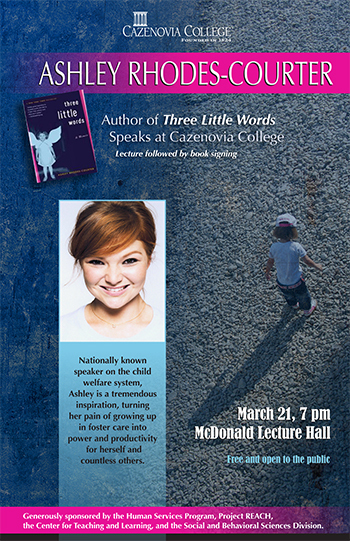 Cazenovia, NY (March 14, 2016) – Cazenovia College hosts Ashley Rhodes-Courter on Monday, March 21, at 7:00 p.m. in the McDonald Lecture Hall on the Cazenovia College campus. Rhodes-Courter is a nationally known speaker on the child welfare system. She has taken her painful experience of growing up in foster care and turned it into a positive teaching tool for human services professionals as well as the layperson. Sponsored by the Human Services Program, Project REACH, the Center for Teaching and Learning, and the Division of Social and Behavioral Sciences at Cazenovia College, this event is free and open to the public. A book signing will follow Rhodes-Courter's presentation.